Really? 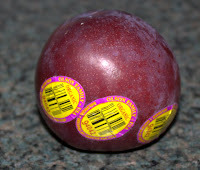 This little organic plum needed three stickers on it? Plus one on the back claiming that it was organic? I spent more time picking off the offending stickers than eating the darn thing. At least it was delicious. So, did the stickers use organic glue, and was the paper produced sustainably? Did the store and shipper add to the price, to purchase and apply the stickers, since the stickers add to the value and the cost to the store? Or discount the fruit because the stickers represent an annoyance factor to the final purchaser/consumer? How sure are you that a dozen box cars of plums from China came into some big warehouse in the dark of night, and some were put in boxes with the stickers you saw, others with stickers that said "Chile" or "California" or "Australia" or "Nardin, OK". OK - I made that up. I don't think Nardin, OK, has that many stickers. Wonderful people, those that live there, but I didn't seem much for stickers when I drove through. God I hate those stickers. I read once that sticker paper/ink is worse than most others too. Yik. The stickers bug me too. I can see that they are helpful to the people stocking and ringing up the produce, but I'd been thinking that they could just put a roll of stickers by the produce and you could just put one on your bag for it. I work at a wastewater treatment plant and they end up here as an annoyance in equipment. I think he takes donations!